Need Winter Greens? Check Your Sidewalk! 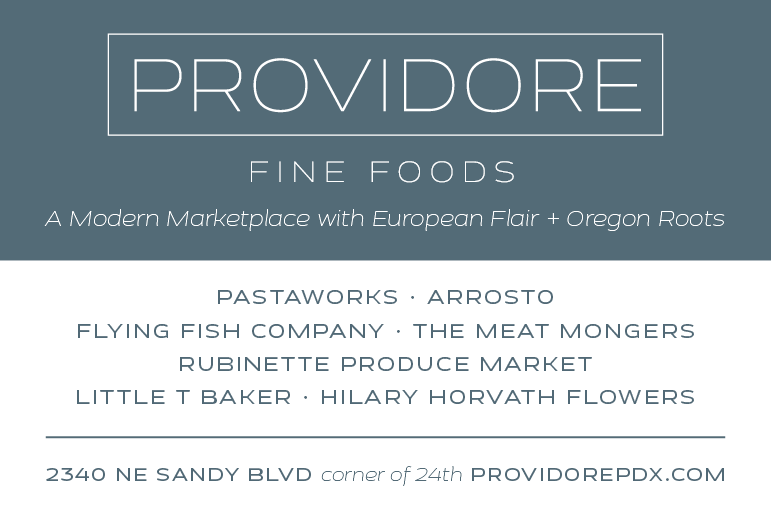 My friend, author, forager and hunter extraordinaire, Hank Shaw, had wanted to come up to Oregon to forage for wapato, a wild tuber that is rare in his home territory of Northern California. Anthony Boutard at Ayers Creek Farm had mentioned he'd found arrowhead in the wetland on his farm, so I asked if Hank and I could come out on his next trip north. I posted about our expedition earlier. This is an excerpt from Hank's post. Arrowhead, wapato, katniss, duck potato, sagittaria. This is a plant of a hundred names. And there is a reason for that. 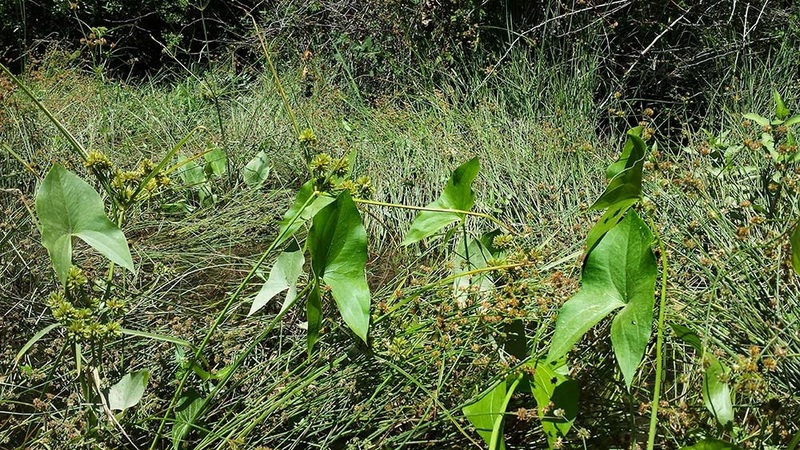 The various species of sagittaria live all over the world—and all are eaten by someone. What you call it depends on where you live. 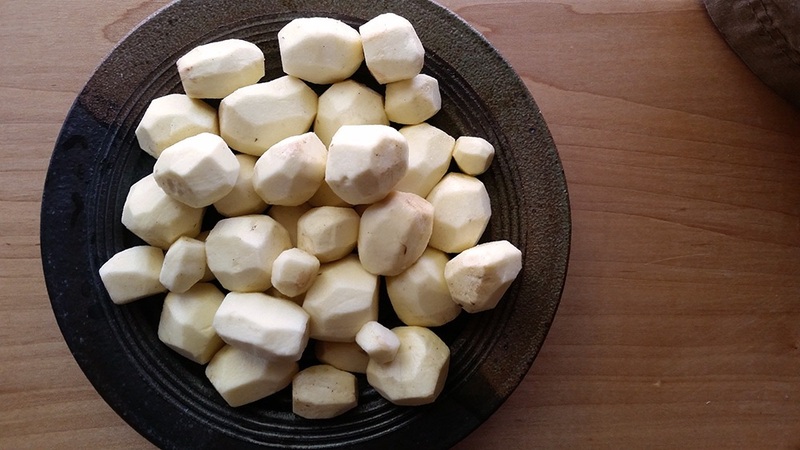 If you are not familiar with them, wapato is one of the finest wild “potatoes” you will ever eat. Wapato, also called arrowhead for obvious reasons. There are about 30 species of arrowhead worldwide. They are an aquatic species, growing in great clumps in swamps and alongside slow-moving steams or rivers. They need permanent, or near-permanent water, and grow tubers ranging from the size of a marble to the size of a goose’s egg. You mostly eat the tubers, but my friend Sam Thayer says the young shoots—before the leaves are fully unfurled—are delicious cooked like spinach and have the same sweetish, corn-like flavor as the tubers. If you can find them, you want Sagittaria latifolia, which has the largest tubers. As you may have imagined, the plant gets one of its names from the leaves, which are shaped like an arrowhead. Buried in the mud underneath these leaves are long, clumpy rhizomes that are the heart of the plant. As the season progresses, the plant sets tubers (actually corms, botanically speaking) that grow and sweeten until they hit their peak in fall. To collect them, you need to get wet. The ideal situation is what we had in Oregon last fall: My friend Kathleen and I were invited to a friend’s farm, and he pointed us to the wapato patches in the wetlands near his fields. The water was barely calf deep, which allowed us to wade in and reach down into the muck to feel for the tubers. This is a far more effective method than twisting your feet into the muck—but only if you are wearing waders. Thayer, a well-known hard case, prefers to strip down to shorts, jumping into chilly water and using his bare feet to do the job. I am shivering just thinking about it. Sam does this because in his spot, the tubers are often in waist-deep water—too deep to do the reach-down method Kathleen and I used. I’d do it that way, too, if I had to. Here in my part of California, wapato is rare. In fact, I’ve only found it in a few places here, mostly tucked into corners of the Delta, where the picture above was taken. I hear it grows in rice fields, but I’ve never seen it there. One advantage while harvesting wapato is that the tasty tubers float. Yep, when you dislodge them, they float up to the surface, making your job a lot easier. If you get into them, you can gather in serious quantity, too. Kathleen and I got this bag of about 5 pounds of tubers in less than 1 hour, in a patch no bigger than a master bathroom. 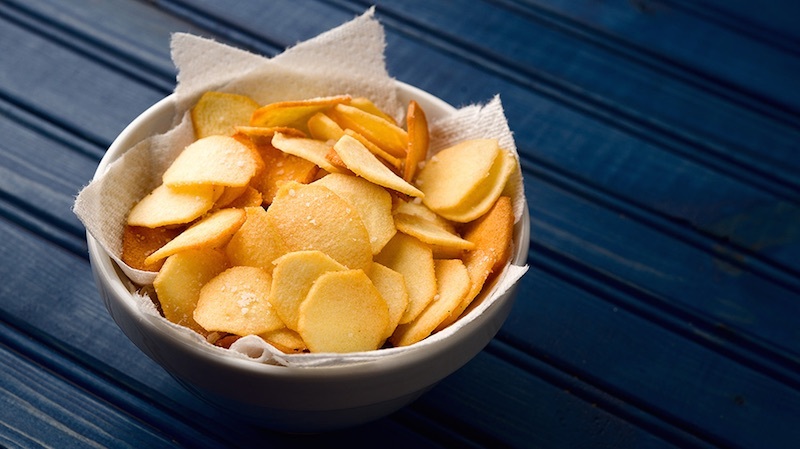 Read the rest of Hank's post and get his recipe for fried arrowhead chips. Photos by Holly Heyser (top) and Hank Shaw (middle and bottom).